In the unlikely event you find yourself nowhere near a cafe and you can't be bothered brewing for yourself, reach for one of these convenient hot or cold coffee solutions. Sydney brothers Ben and Erol Salcinovic are the brains behind this most Australian way of packaging a beverage in bulk. The brothers brew selected beans from Single Origin Roasters by cold immersion for 24 hours. As an immersion brew it has a much denser body than cold-drip, with the suspended solids giving it a character somewhere between espresso and pourover. The flavour is like a clean, brewed specialty coffee: there's nicely acidic fruit, without the boozy character of cold-drip. Darlo is a "concentrate": the brothers recommend serving one part Darlo with one part of whatever you want to mix it with – water, milk or even something stronger. Milk tends to blur the fruit – this is better black. Surprisingly, Ben and Erol aren't the first people to put coffee in a box – New York City's Wandering Bear Coffee Co beat them to the punch last northern summer. Also check out Adelaide's Mischief Cold Coffee, which comes in flagons for the really thirsty. Filter coffee on the go ... UCC's one-cup filter bags. 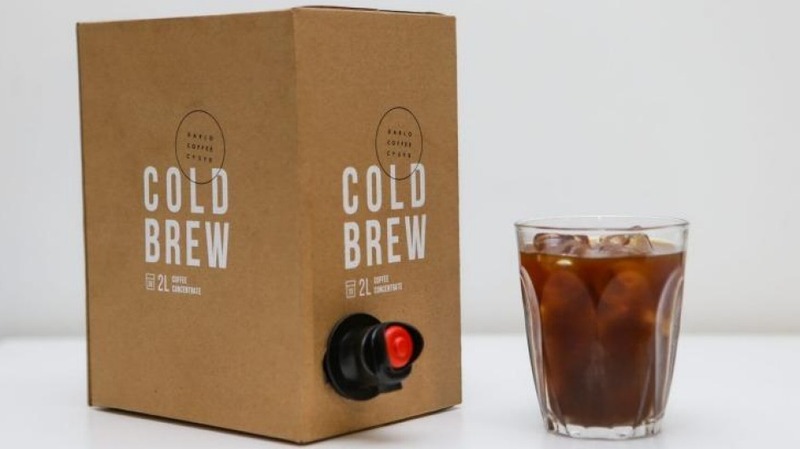 Coffee in a bag – why didn't someone think of that one sooner? Folger's, Maxwell House and others in the US already have, but there's often a bit of instant in there, too. The secret of Jed's Bean Bags is the shape – the pyramid form is similar to that used for premium silk tea bags, and the company says they give better extraction by allowing the coffee to swirl around inside the bag. They let off a nice whiff of ground coffee when you crack the foil envelope. A No. 3 ("Strong") had an aroma of caramel and a hint of savoury spice, though the flavour was a bit flat and lacking brightness. A No. 4 ("Very Strong") had a darker aroma with a hint of the "rubbery" aroma typical of robusta coffee and a bit of milk chocolate sweetness. The coffee is a blend of arabica and robusta beans from various origins. For old-school plunger coffee drinkers. Jed's Bean Bags, $6.99 for a packet of 10 from Woolworths supermarkets. 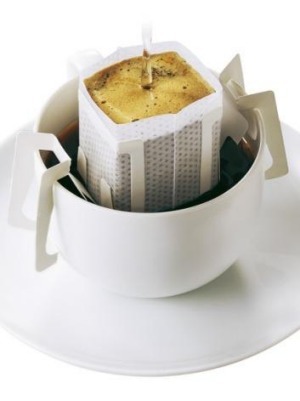 Japan describes itself as a "convenience culture", and these nifty single-cup bags are like little origami pourovers – handles fold out and attach to the cup, opening and suspending the filter so you can pour hot water through the grounds. The grind is relatively coarse, and it even blooms like a pourover when you add water. The similarities with a good V60 end there, though – the flavour is quite flat and the aroma no more than "hot coffee". Tastes better with a country ryokan breakfast. UCC one-cup filter bags, $12 for 12, available from Japanese supermarkets and grocers. Salvage Specialty Coffee in Sydney's Artarmon bottles a cold immersion brew of their seasonal single origins – at the moment it's a Bolivian, but Guatemala and Colombia coffees are just coming, and they'll be followed by some Africans. The five- to 10-hour immersion brewing produces a lighter, more floral result than cold-drip, says Salvage's Toby Cutler – perfect for highlighting the characteristics of these fresh seasonal coffees. Good over ice in a glass, or straight from the bottle if you're on the go. You can also pick them up from Artificer Coffee in Bourke Street, in Sydney's Surry Hills. Salvage Cold Brew, $5 for 200ml. 5 Wilkes Avenue, Artarmon. The Melbourne-based First Press uses a 10-hour cold-drip to make their bottled brews. There are two varieties: a seasonal Brazil that First Press' James Elias says is roasted to the same profile all year round, and seasonal single origins: recently from Ethiopia and Honduras. Elias says the cold-drip method makes this healthier than other coffee: less extraction of the bitter oils makes cold-drip easier on the digestion. No surprise, then, to find First Press in health food shops in Sydney, Melbourne and Brisbane, right near the kombucha tea, as well as in specialty cafes. You'll also find it in the fridge at gyms, where it doubles as a performance enhancer for the bulletproof coffee brigade. But it is coffee – a clean cold-drip brew with the liquor-like aroma characteristic of this method, sweet rum-and-raisin chocolate flavours, a nice mouthfeel and a pleasant boozy finish. Comes in 50ml single shots and 500ml Big Boys. These are a Tokyo traveller's best friend on a hot day, with vending machines dispensing them all over the place. In Australia you'll find them stocked in Japanese supermarkets and grocers. Most are mixes of coffee, coffee extract, milk and sugar in a bewildering range of black, milk and mocha varieties. The cans feature bold (some would say lurid) graphics. Suntory's Black Boss contains just coffee, though, and the black can says "serious, grown-up". When you pour it out the colour is very light and the aroma best described as "coffee-like". The watery flavour is reminiscent of a black iced coffee when the ice cubes melt. Black Boss, $2.50 for 190ml, available from Japanese supermarkets and grocers.